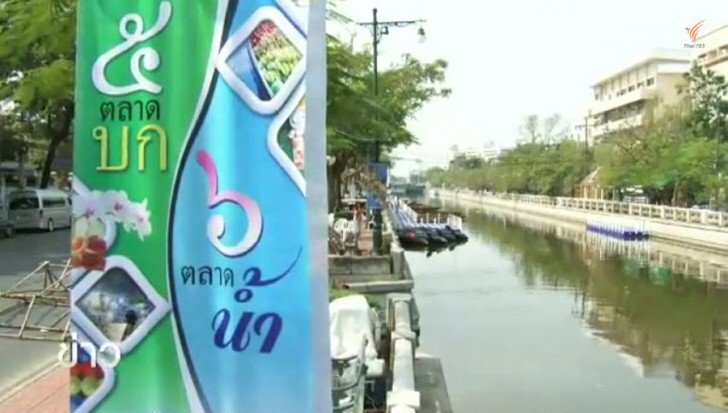 Beginning tomorrow February 12, Bangkok will have a new floating market along the Klong Phadung Krungkasem canal to become a vibrant tourist attraction. This new floating market is the initiative of Prime Minister Gen Prayut Chan-o-cha who wished to resurrect the Thai traditional canal culture which once thrived on the many canals in Bangkok. Under his initiation, the Lhuk Luang pier as well as the pier in front of Wat Somanat temple is undergoing a major renovation in preparation for the Klong Phadung Krungkasem Canal Floating Market Festival. Large plastic pontoons have been attached together to form rafts in order for tourists to buy merchandise from the many boats that will be plying their wares. An estimated 90 boats of various sizes from five land-based markets and six floating markets will be attending the event. The event aims to recapture historical Thai canal culture and traditional Thai foods and delicacies from the Rattanakosin period will be made available to visitors. According to Mr Atthaporn Suwattanadecha, deputy permanent-secretary of Bangkok Metropolitan Administration, who is in charge of the Klong Phadung Kasem canal renovation between 80 – 90% of the preparations have Ben achieved. He said the prime minister himself has personally stressed that this floating market must highlight traditional Thai lifestyle which puts emphasis on natural coexistence and historical canal living. Klong Phadung Krungkasem canal was conceived by His Royal Majesty Rama IV with the intention of expanding capital to show foreign visitors that Thai society was civilised. The other aim was to ease the ever growing population increase within the capital out to its periphery by constructing numerous interconnected canals to allow convenient travel. “His Majesty Rama IV in his supreme foresight only allowed foreigners access into the capital following the signing of the Bowring Treaty in 1855. Foreigners never the less were only permitted domiciles on the outer fringes of the capital hence many consulates and embassies were constructed in these areas,” he said. Thai lifestyle underwent a major change during the Rattanakosin period during the reign of His Majesty Rama V when on-land travel became more predominant superseding canal travel. As a result more and more land-based markets cropped up which lasted up to the present. One of the major obstacles that will have to be overcome in order to make floating markets popular again will be access to these historic destinations. Roads and other form of transport allowing convenient access to the markets must be constructed so that visitors can easily travel to and from these historically significant location. He says “many people today are oblivious of the fact that historically there was an alternative lifestyle that thrived along the many waterways in the capital. But what cannot be denied is that during that period travelling on the canas was the main mode of travel within and around the capital. Thus somehow if we are able to present the attractiveness of combining historical waterways lifestyles with present day land-based living through the use of modern transportation technology then we may see a return of the traditional living. But a resident living near the canal viewed it remained to be seen whether traditional waterways living can be successfully resurrected. However, he said the effort is a positive step towards a return to a more beautiful and benign period in Bangkok. In any event the public is being given a valuable opportunity personally experience how citizens of old Bangkok lived their lives on these beautiful canals from the February 12-18 on the Klong Phadung Krung Kasem Canal. Such opportunities are very rare indeed, he viewed. Has Samui seen the last of its walking street markets?